A video showing the Philippine Daily Inquirer ‘walkout’ while Atty. Glenn Chong talked about some serious allegation versus Smartmatic and Gen. Carranza of CALABARZON IV-A re Red Santillan torture-murder case goes viral. In the video, Chong grabbed the chance to talk once again in front of reporters about the P150-million police operation that supposedly targeted him because of his exposé on election fraud versus Smartmatic. Luckily for Chong, he was not in his car when the supposed police encounter happened. But his security aide-driver paid the ultimate price. Anyway, what happened was, while he (Chong) was talking about the P150-million police operation and Smartmatic involvement, the cameraman from the Inquirer made the quick exit. This was captured on video and shared by Chong on Facebook. In the video, Chong claimed that his source was a government official with connection to the intelligence community. Meanwhile, the Inquirer walkout couldn’t stop social media peeps to make unflattering comments and speculations versus the national daily newspaper. Mohammad Omar Gabriel Malaki partida ng mga mainstream media na gaya ng sa PDI sa P150M ni Carranza kaya panay ang pa-presscong pabango dahil amoy pusali na ang pamunuan ng Kapulisan. May ambition si Carranza na palitan si Agbayaldeng nag-blackmail sa pagtanggap niya ng partida niya kaya di maka-piyok! Baylon Musin Huwag kang mag alala Atty, kung scope sa Inquirer sa mga kasong involving twaling personalities, wala nang naniniwala dyan. 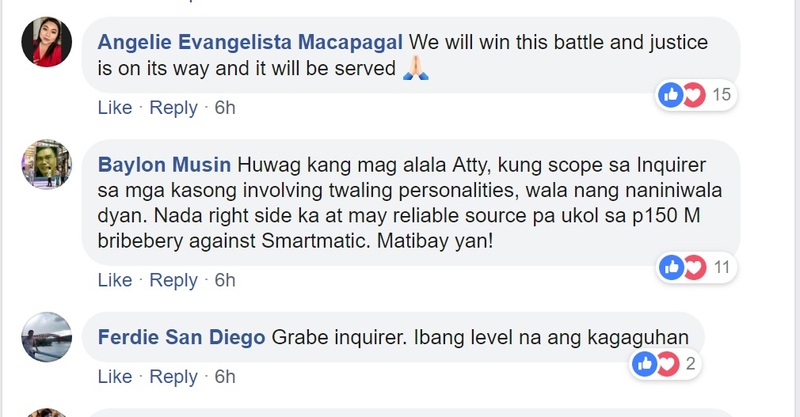 Nada right side ka at may reliable source pa ukol sa p150 M bribebery against Smartmatic. Matibay yan! You may read Chong’s full post below.